January 23rd, 2016 Langford, BC (ISN) – The Victoria Shamrocks and local lacrosse fans alike celebrated together the accolades of the Shamrocks 2015 WLA season on a Shamrocks Mann Cup Fan Appreciation Day that also saw forward Jesse King accept his Western Lacrosse Association first team all-star award, and two team-honored awards. A Victoria native, a younger King looked to future aspirations as a professional hockey player, but as season’s ice would disappear from local rinks King perhaps couldn’t shake that feeling of being at the rink. When asked how he ended up trading a hockey blade for a pocket and sneakers instead of skates, the revelation wasn’t a surprise. “ I started playing hockey before any other sport like a lot of Canadian kids, tried playing a little baseball, and my friends were joking around and making fun of me because they were all playing lacrosse and I wasn’t, so being young and impressionable…I guess started playing lacrosse,” King would confide. Peer pressure being as cruel as it can be at a young age, was definitely a fortuitive guiding light for King and the Mann Cup Champion Victoria Shamrocks. King would cut his junior lacrosse teeth playing in the Juan de Fuca Lacrosse league, and then a dominant career with the Junior A Shamrocks. The 6”2”, 205 lb. King would be drafted sixth overall to the Victoria Shamrocks in 2014. It didn’t take long for the twenty three year old hometown product to make his presence felt at Ohio State University, in the WLA, and on his Shamrocks team. 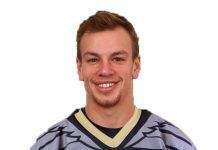 A graduate of the Ohio State’s lacrosse program, King, playing only in his second year in the WLA, finished seventh in league points scoring 33 goals and 31 assists for 64 points in 16 games. King continued his strong play in the postseason, scoring 13 goals and 19 assists in 11 games between the WLA playoffs and the Mann Cup championship. Recognized by the Minnesota Swarm of the NLL for his play, King recently realized his dream of a professional career after being drafted 3rd overall last September by the Swarm. Alongside his WLA award, King was also honored with two team awards. King would receive the George Blackstock Memorial award as team MVP, and the inaugural Chris Hall Memorial award as the player voted by his teammates to have the most competitive spirit. King looks forward, as sure as most Shamrocks fans do, of winning another Mann Cup, and a fruitful professional career with and against former teammates he comes across in the WLA and the NLL. 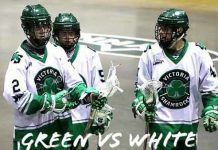 With 11 of the Shamrocks 27 players on the 2015 roster calling Victoria their hometown, it is any easy bet that Victoria is, and will continue to be, a lacrosse talent hotbed for years to come.